If you are trying to find that extra storage area in your bathroom, then utilizing the area over the toilet makes sense. You cant really use it for anything else other than to hang a picture, so why not use this area. ​I personally had come away from this idea because I hated the open rail style shelf idea for dust and moisture and powder which my family loves to use and ends up everywhere, so after some research I discovered closed cabinet ideas to house anything you need to hide in the bathroom. This is easy to install without construction and gives you lots of space. What I really like is that there is a cabinet with a door for your smaller items you like to store. This gets many little things off the vanity and organizes your bathroom no matter how small. 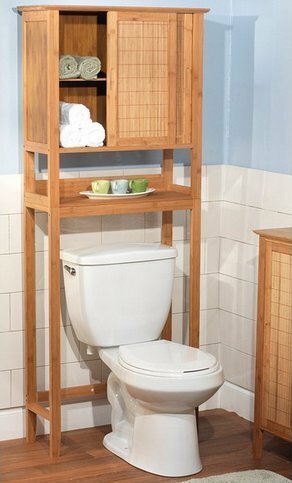 The space over the toilet is the perfect place to start when looking for storage ideas. 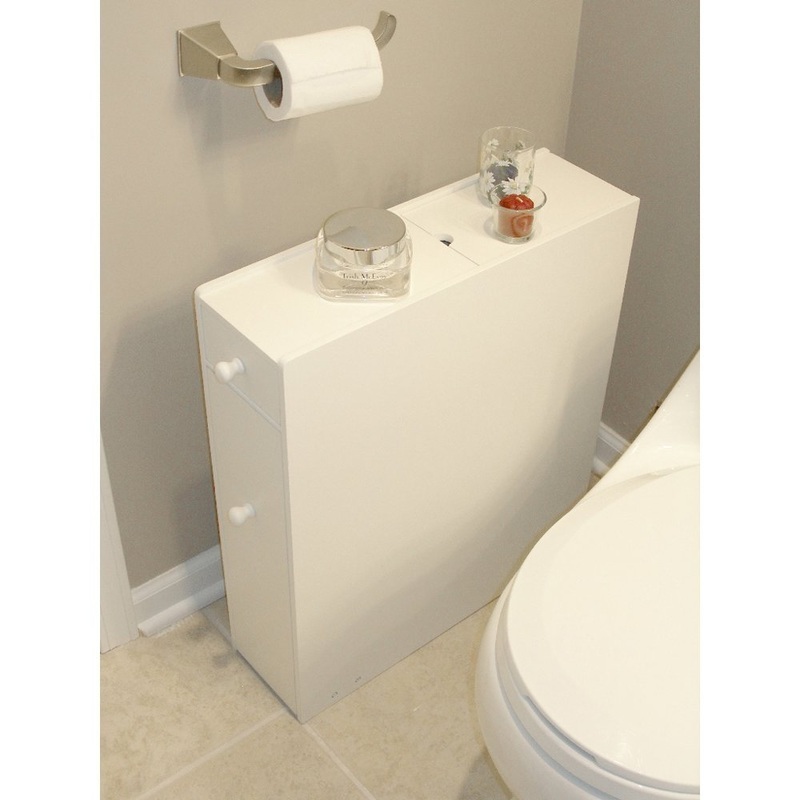 Also if you have a pedestal sink you can get pedestal sink cabinets for even more storage. This model has more closed off area, which I think really makes a bathroom look organized and neat. If you have lots of things you wish to store on these shelves, then maybe consider one with doors so you don't end up with just a mess over the toilet. You also don't want things falling into the toilet (been there done that!) So getting little trays from the dollar store for small items will make it easier to get things in and out. There are many different styles to compliment your bathroom décor. This one also has double doors to hide your things. I have lots of little things so I love the idea of cabinet doors to hide them away and to not have things fall in the toilet. I thought this one looked quite elegant! ​The one I have now in my bathroom was here when we moved in. It is an open shelf style with rails across rather than solid shelves, and I really do get frustrated with it as it can't hold smaller items. So I use baskets, but because the shelves are open the things get dusty and I really don't like that idea. 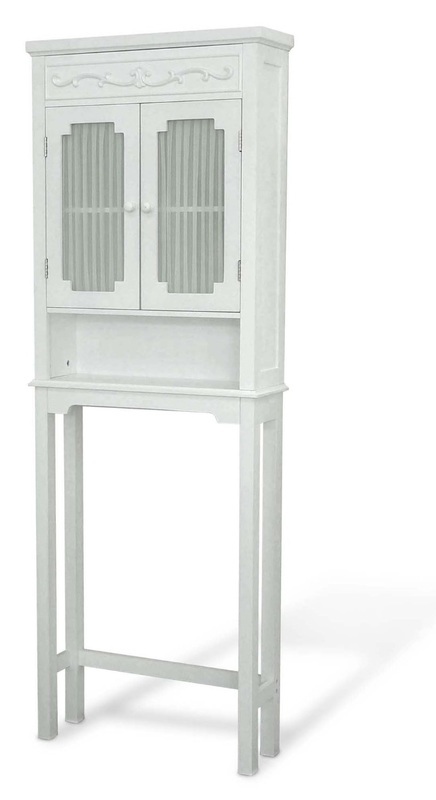 ​So I am in the market for one of the above styles with the cabinet doors, to keep dust out and keep my things clean and tidy. It all depends on your personality. If you don't mind your supplies on display such as with towels then open shelves would work for you, but if you need to store many smaller items, solid shelves and cabinet doors would work best in my opinion. If you prefer the look of open storage, then at least consider ones with solid shelves, so that you can place smaller decorative items on them as well. The rail style shelves are difficult for anything other than towels, but this one does give a lighter feel to the room. ​If you are renting your space, you have to keep your storage areas portable. Unless you can convince your landlord to attach cabinets to the wall, I have always found rented spaces lack in storage. Not sure why, guess the landlords want to keep things simple. ​So any storage you do invest in needs to be portable. As someone who has rented before, this doesn't have to be tricky. You can still have style and comfort and make the space your own without renovation or holes in the wall. These are things that you can take with you when you move but can completely change the look of the bathroom and reflect you. 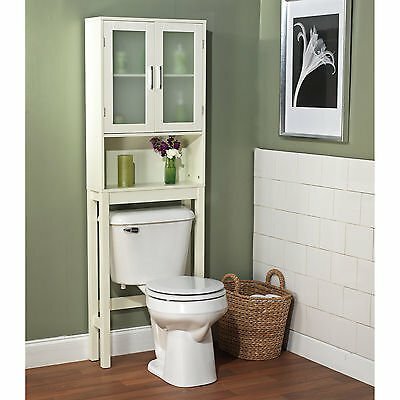 ​After much research in many stores, I got frustrated at the options, but once I started researching Amazon I was amazed at the different storage ideas you can use to create a unique bathroom just for you. Pedestal sink? no worries, you can get pedestal sink cabinets that simply roll right underneath with tons of storage. Then the over toilet storage cabinets and shelves as above, and even beside the toilet slide in cabinets as below. If you don't like the idea of storage over your toilet area, and you have a little bit of floor space, you can fit this cabinet with slide out drawers between the toilet and the sink. I thought this was an awesome place to fit some extra storage. Could be used for toilet paper as well as any other personal items you may need handy beside you instead of above your head! Hinged Mirror Cabinet - Use the Bathroom Door Hinges! As I was researching ways to add storage to my bathroom without renovation, holes or excess money!... I came across this mirrored cabinet door that actually uses the present door hinges for install. So you are not renovating or causing any damage other than you need to fit it into the present door hinges which might take two people to do. Click on the above picture or link and see the little video they show for it. ​But look at all the extra storage space you get without taking up a lot of room! Plus the bonus is a nice big mirror. You could put this on the back of the bathroom door or even your bedroom door. I thought this was an ingenious idea! Especially if you are renting or simply don't want anything permanent or that could cause damage or needs tools to install! ​I have found shopping online to be a great way to find more ideas and great products. I have always trusted Amazon and therefore love to shop there.